Home Brands Bosch Tronic 2.5 Gallon Mini Tank Water Heater:The Tank Water Heater For All Your Needs! Bosch Tronic 2.5 Gallon Mini Tank Water Heater:The Tank Water Heater For All Your Needs! The Bosch Tronic 2.5 Gallon Mini Tank Water Heater is an excellent choice of water heater. As you might know, there are different types of water heaters available in the market. That is why choosing the proper water heater based on your needs might be a bit tough, especially if you don’t have any knowledge. So, before we go into the details of this particular heater, let’s have a look at the determining factors for choosing the right water heater. The fuel of the water heater plays a key role in deciding what type of water heater you need. This is not only because of the cost effectiveness of certain fuel (or source of energy), but also because the installation process for each of them varies accordingly. Additionally maintenance of the units also take some extra time and knowledge, which might not be known to you. In order to maximize the operating and energy cost, you need to look at an efficient water heater. The efficiency factor is dependent on the factors like recovery, standby losses, cycling losses, and other losses. The recovery efficiency is how efficient the fuel is in heating the water. While the standby losses are the percentage of heat loss per hour and the cycling loss is the percentage of heat loss per cycle. The size of the water heater also matters, because it decides how much water can be heated during a given amount of time. Additionally, the storage of the heating device matters. Last but not the least, you should also consider the price of the heating unit, so that you can buy and install it, without going out of your budget. Maintaining a water heater might also cost you some additional amounts, so do keep that in mind, when you are buying a water heater. If you have a storage or tank water heater, you might need to flush a certain amount of water to keep it clean. Additionally, you might also need to replace the anode rods after some time to make sure that the water is being heated properly. So, now that you know about the determining factors for choosing a proper water heater for your home, let’s look at the features of a mini tank water heater. 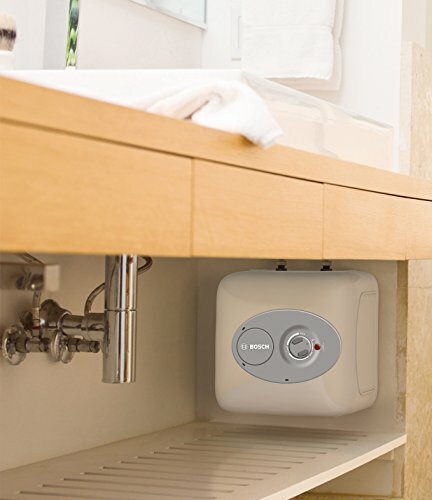 The Bosch Tronic water heater is available in three sizes, and can be hung from the walls, with the help of brackets or kept on the floor. Since they are compact in size, they can fit well under a sink, or can also blend in with the existing decoration of the house. Let’s have a look at the unique features of this water heater. The Bosch Tronic 2.5 gallon mini tank water heater consists of a long power cord, and uses electricity for its heating. Also, since it consists of a mini tank, you can use the heated water anywhere you want, and anytime. The compact design makes it easier to store the tank anywhere you want. Being portable, you can carry it with you when you need it. One of the unique features of the Bosch water heater is that it is equipped with fast recovery rate, so you don’t need to wait for too long for the water to be heated, and can use it as soon as you need it. Bosch is a renowned brand name in the domain of water heaters. Another renowned brand name is EcoSmart. So, let’s compare the EcoSmart POU 3.5 Electric tankless water heater with this. The EcoSmart water heater saves up to 60% of your energy costs for water heating, and is easy to install. Also, it displays temperature digitally, and can be adjusted in one degree increments. It has a compact design, and if you need to install it, you can save up to 12 cubic feet of storage space, compared to other tankless heating devices. The heater is controlled by flow, which means the heat will depend on the water flow, and the temperature will be adjusted accordingly. 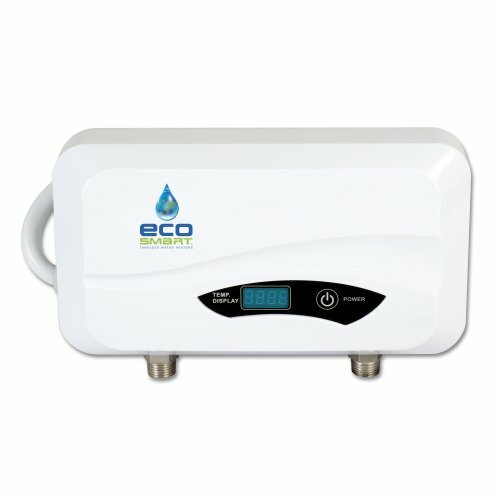 On the negative side, it is the smallest available tankless model from EcoSmart and cannot be used to run more than one sink or when the temperature of the intake water is lower than 57 degree Fahrenheit. Additionally, the price is a bit high compared to the Bosch Tronic 2.5 gallon mini tank water heater. If you are looking for a portable tank water heater, which can save your energy consumption costs, while providing you with heated water, the Bosch Tronic mini tank water heater is the perfect choice for you. It is not only energy effective and comes with a great set of features but it is also cost effective. With the help of the external dial, you can moderate the temperature, and because of the presence of the tank, you have hot water at your disposal throughout the day, even when there is no water flow.